Peapod Labs has created seven different alphabet applications, all related to different categories of vocabulary. 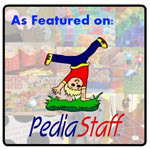 From zoo animals to sports to vehicles, Peapod Labs includes real-life photos and videos of various alphabetized nouns. 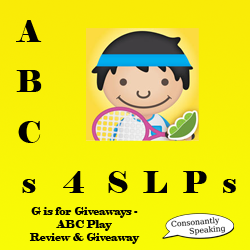 To learn more about the ABC Play application and enter a giveaway, continue reading. The Main Page of this application will show 110+ boxes to press, categorized by letter in alphabetical order. Once a button has been pressed, an image will appear of a sport scene with illustrated children holding up each letter of the word at the bottom. Pressing the "ABC" button will bring you back to the Main Page with all of the words. Pressing the screen with outlines in the left hand corner will bring you to a screen where the user can swipe on the dotted outlines to reveal images from sports. 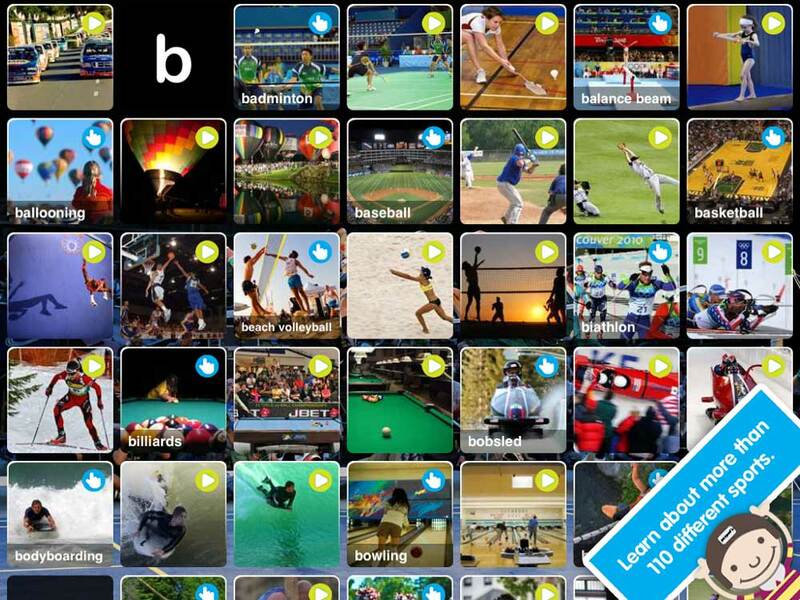 Pressing the square with a play symbol in the left hand corner will show a video of a sport (must have internet connection to view). In addition, you can create user accounts by signing up with Peapod Labs. I love that the words are categorized in alphabetical order and that all of the words are related to different sports throughout the world. The interactivity of the application including fun facts, an invisible scene to swipe across the screen to reveal, and videos of the sport are great for learning more information about various vocabulary and keeping students motivated. The fact that the words are spelled out beneath the images help students learn how to spell different words. In addition, it is fun to jump to various letters when pressing a letter on the words. I would like to have both the videos, facts, and the outlined images to be accessed on the same page so that words are not repeated twice. It would be great if the videos were loaded into the application so one would not require internet access to view them; however, that would take up a significant amount of memory, so I am not sure if this could be done. It would be great if instead of the application moving to words related to the letter pressed that the application would state the letter or its sound aloud. It would also be wonderful if the word were stated aloud and/or sounded out. You could still keep the interactivity of moving between words but maybe if the letter is pressed twice. That way they are learning how to say the words along with their spellings. RtI - Children can learn about letters in the alphabet and initial letters in words using this application. Receptive Language - There is a significant amount of vocabulary related to sports in this application. Discuss how games are played, the rules of a game, how many players play in the game, what the different players do in the game, the equipment used to play the game, where a game is played, how to earn points, etc. Discuss what the equipment looks like, uniforms/safety gear look like, etc. Social Skills - Discuss good versus bad sportsmanship, the rules of a game, being okay with losing a game, giving compliments to other players in a game, and more. Write social stories for students who have difficulty following the rules of a game or become anxious/upset when playing a sport. Have students talk about their favorite sport, what sports they like to watch vs. play, and what their favorite sports teams are. Expressive Language - Have students talk or write about their favorite sport, sports they play, or favorite sports team. They can even write a story about a sports event they went to/saw on television, a game they played in, their favorite sport, their favorite sports team, or the rules of a sport. Sequencing - Have students sequence the events in a story about a sports game or how to play a certain sport. Articulation - Choose a letter that matches the speech sounds a child is working on to have him or her practice the speech sound in a word. ABC Play - words about sports with pictures, sounds, and videos for kids is available for the iPod Touch, iPhone, and iPad for $2.99. 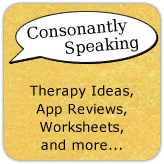 Consonantly Speaking was given application codes to give away with this review. No other form of compensation was given. Enter the giveaway below to win one of many ABC Play application codes!